Welcome to the 57th annual O.N.A. Convention page. Plans for our 57th annual convention are underway. Check back often for new information and updates as they become available. Click on one of the vertical tabs below to show more detailed information on that topic. See the program of events listing for a complete schedule. * All rates are net non-commissionable and subject to the total tax and fee rate for Guestrooms of 16.39%. A valid credit card is required to guarantee all reservations. Individuals making their own reservations should contact the Hotel at 1-800-267-7880 or email at reservations@ambassadorhotel.com, and quote the Group Name Ontario Numismatic Association. The Hotel will honour reservations received by the March 12, 2019. Reservations received after this date are subject to space availability and rate availability. For a list of committee members please click on the Convention Committee tab. Register quickly and securely online using PayPal or by sending in the completed registration by mail along with a cheque to the address noted at the bottom of the form. The Registration Chairman and the O.N.A. Treasurer will also accept completed forms at many of the local area coin shows or club meetings in Southwestern Ontario. Kits must be picked up at the convention during hours specified in the program of events. Requests for additional items will be accepted during the registration period pending availability and combined with your existing order. 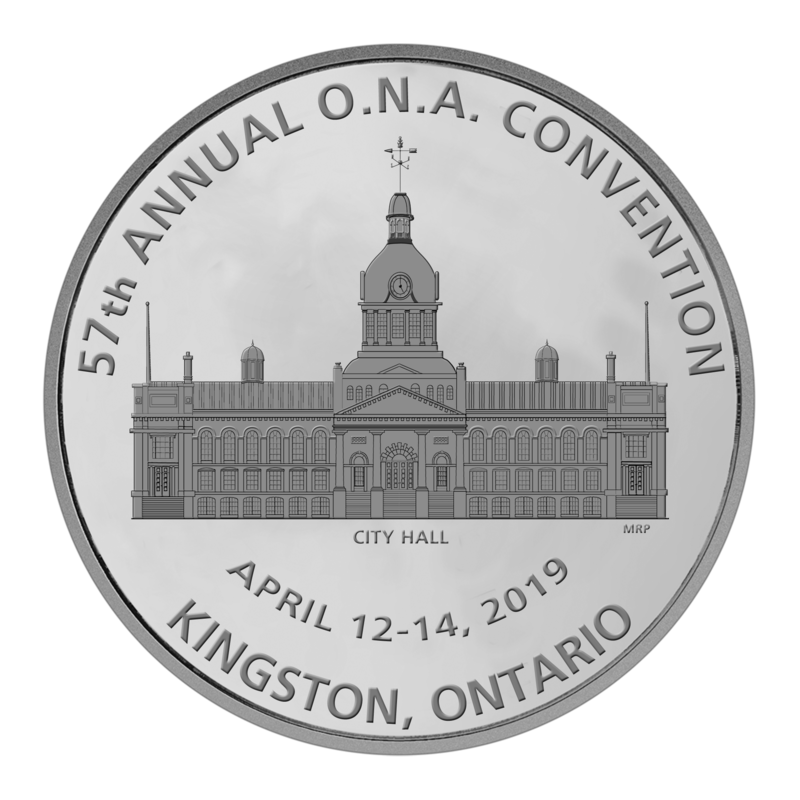 Our 57th convention medal design was chosen by the convention committee from a conceopt design submitted by Kingston Numismatic Association member Michael Platt. The medal features the Kingston City Hall circa 1867. Silver and Brass medals will be in short supply with a limited mintage of only 30 and 25 respectivley. Copper will also have a limited mintage of 80 this year. These beautiful, heavy cameo, medals are sure to sell out so reserve yours today! Banquet Speaker - Our Banquet speaker this year is Peter Gower. Our Education Chairman, Scott Douglas, is pleased to announce our Friday, April 12, afternoon Education Symposium! "The Ontario Numismatic Association is proud to present three of Ontario&apos;s premier numismatists participating in the Educational Symposium on Friday, April 12th at our 2019 convention in Kingston," said Scott, "It is my hope that everyone will attend what is sure to be an informative look at our world of numismatics. From education we gain knowledge. With knowledge we gain wisdom." You are invited to attend all Education Symposiums free of charge, everyone is welcome. You are invited to attend all O.N.A. member club meetings free of charge, everyone is welcome. floor open to the Public! The following events are taking place specifically for Youths (under the age of 18) members and their visitors to the O.N.A. convention. 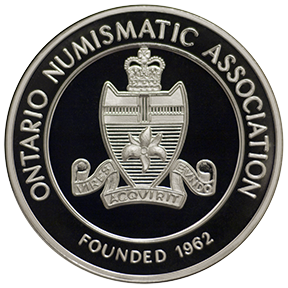 The Ontario Numismatic Association, in conjunction with the Royal Canadian Numismatic Association, are pleased to invite you to visit the Junior Numismatists table located just outside the bourse room. Material is graciously donated by numismatic dealers, club members and the Royal Canadian Mint. Please parents, be reminded that this table is strictly for juniors. Let your young numismatists have fun, Absolutely NO coaching or prompting! The material is available at "special" pricing to to make the hobby affordable for young numismatists. The RCNA Coin Kids Auction has been a continuing success. Let's do it again this year! Remember, space is limited to the first 50 juniors to register for the auction. Register early and avoid disappointment! Why not maximize your enjoyment of the convention by registering as a convention attendee. The Junior Registration Kit, containing many great items, is just $5.00! Interested in Exhibiting at the ONA? Please fill out and mail in the Exhibit Application form below. For further information please contact our 2019 Exhibits Chairman, Chris Boyer, by email at this link.